Tour the most extraordinary bookshops across the globe, from a hidden gem on Santorini to a repurposed church in The Netherlands. By Elizabeth Stamp for Architectural Digest. 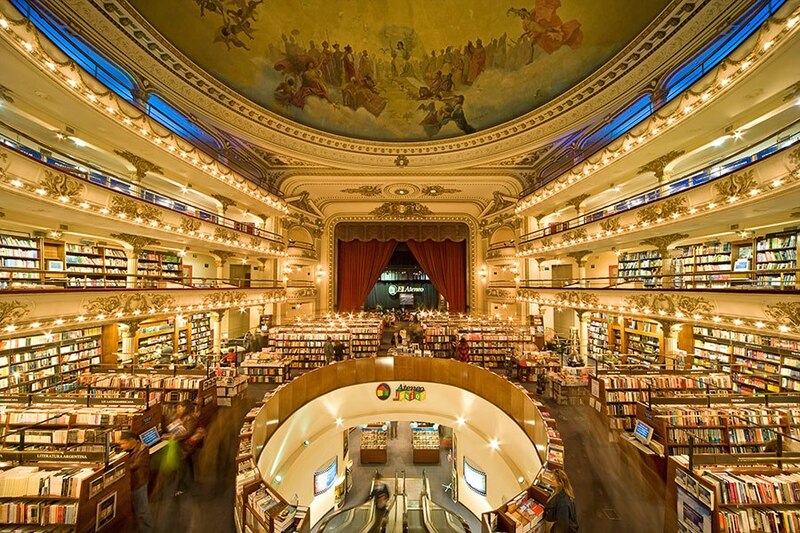 Architect Fernando Manzone transformed a former theater into a spectacular branch of El Ateneo, the Argentine bookseller. Located in the Recoleta area, the 1919 building displays rows of books beneath the domed ceiling painted by Italian artist Nazareno Orlandi and along the ornate balconies. Avenida Sante Fe 1860, Buenos Aires; yenny-elateneo.com. Shoppers can feast on words as well as food at this inventive bookshop in Brussels. 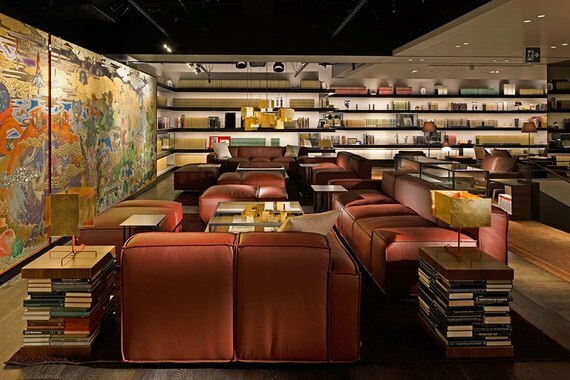 Designed by interior architecture firm Delacroix & Friant, the store is spread over two buildings and divided into nine uniquely decorated sections, each with its own dining area. 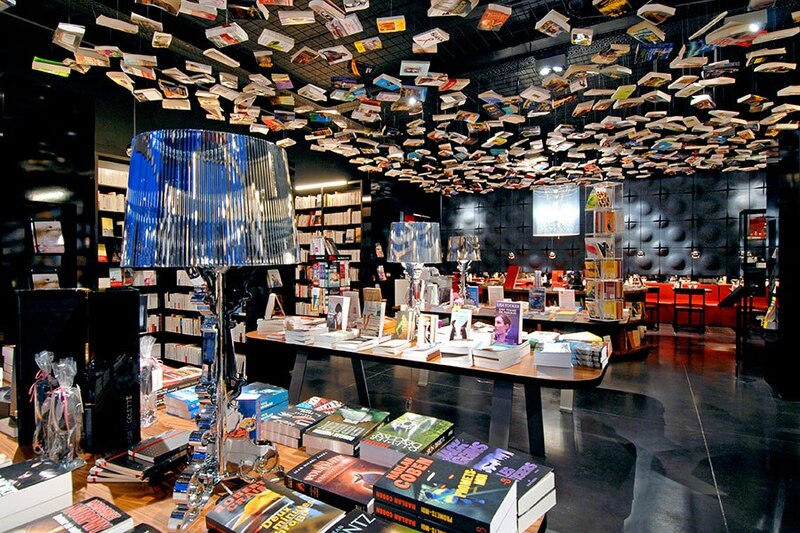 Books appear to hover above the black-and-red fiction department, while an Airstream is the centerpiece of the travel area. Place du Temps Libre 1, Brussels; cookandbook.be. Set in a 20,000-square-foot space in downtown Los Angeles's Spring Arts Tower, the Last Bookstore is a madcap cross between an independent bookstore and an art installation. 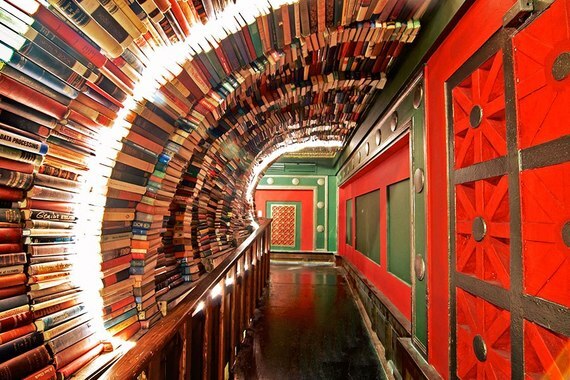 The airy space is filled with creatively repurposed volumes, including a mural and tunnel made out of books. 453 South Spring Street, Los Angeles; lastbookstorela.com. Architect Chu Chih-Kang took inspiration from the life of a Tang Dynasty Buddhist monk and scholar when creating the concept for the new Fang Suo Commune location in Chengdu. Designed as a knowledge depository, the subterranean space features a variety of natural materials, such as concrete, copper, iron, and sycamore, which are combined to create dramatic, almost Brutalist interiors. Taikoo Li mall, Chunxi Road, Jingjiang District, Chengdu. 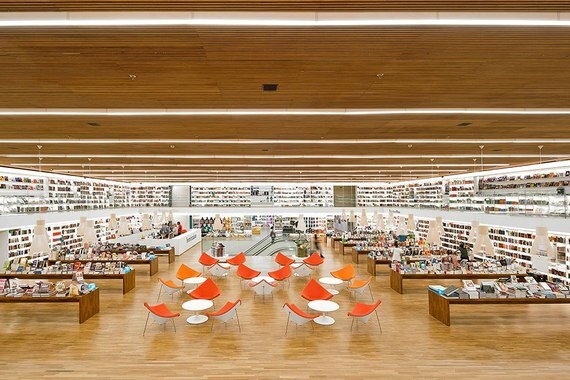 A cross between a bookshop and a town square, Livraria Cultura's outpost in the Jardim Paulistano neighborhood offers plenty of spots to linger with friends or the latest hardcover. Architecture firm Studio MK27 designed the sprawling location, which includes a cavernous top floor with 69-foot-long bleacher seating and two levels of books. Iguatemi mall, Avenida Brigadeiro Faria Lima, 2232, São Paulo; livrariacultura.com.br. 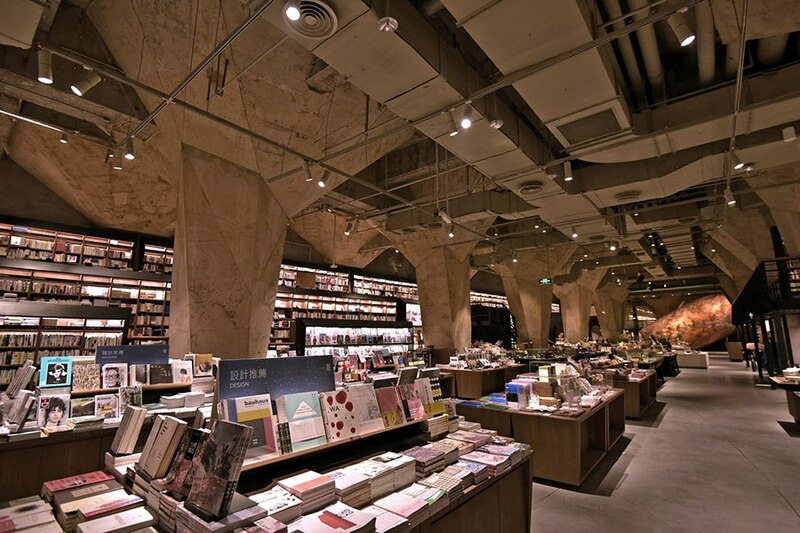 Designed by Klein Dytham Architecture to feel like a "library in the woods," Daikanyama T-Site is composed of three buildings connected by a central corridor known as Magazine Street. Each pavilion is clad in latticelike screens of interlocking Ts and low-emissivity glass, which reflects the surrounding trees. Inside, the Anjin Lounge is decorated with a screen by contemporary artist Masatake Kosaki and a bar and tables made of secondhand books. 17-5 Sarugakucho, Shibuya-ku, Tokyo; tsite.jp/daikanyama/. The esteemed publishing company celebrated its 20th anniversary last year by opening its first international flagship, in London's Piccadilly area. The 5,400-square-foot store is set in a 1922 building designed by Sir Edwin Lutyens, and shoppers can commission custom-made volumes from the on-site bookbinder, dine in the café, and outfit their home library with both books and furnishings--including a curated assortment of antiques displayed in the "cabinets of curiosities." 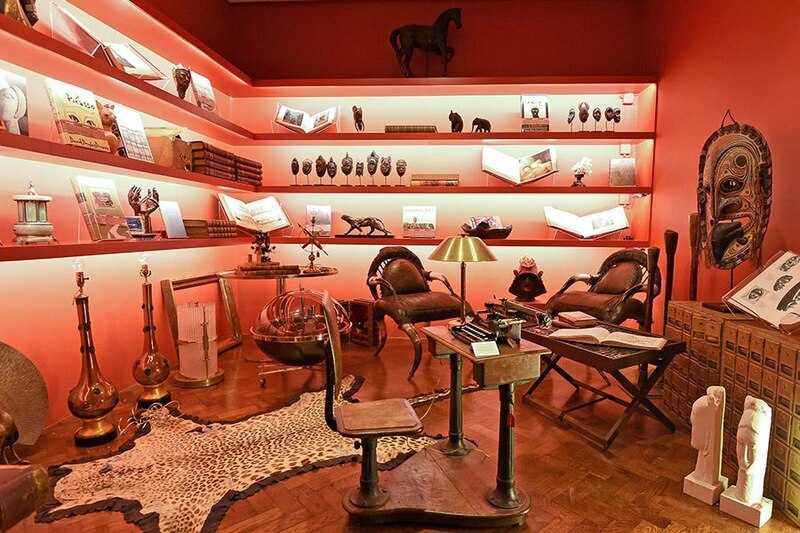 196A Piccadilly, London; assouline.com. 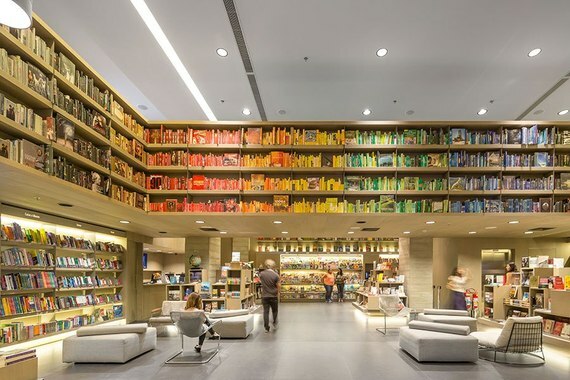 Studio Arthur Casas crafted a colorful, four-story outpost for Brazilian bookseller Saraiva. The double-height first level is bordered by a rainbow of books arranged on warm walnut shelves, and seating options by Brazilian designers such as Sérgio Rodrigues offer pleasant spots to read. Avenida das Américas 3900, Rio de Janeiro; saraiva.com.br. Click here for even more of the world's most stunning bookstores.